Who doesn’t like new bling? Who doesn’t like new boat goodies = gear, tools, toys, stuff? Combine the two and you have a winning combo sure to please. 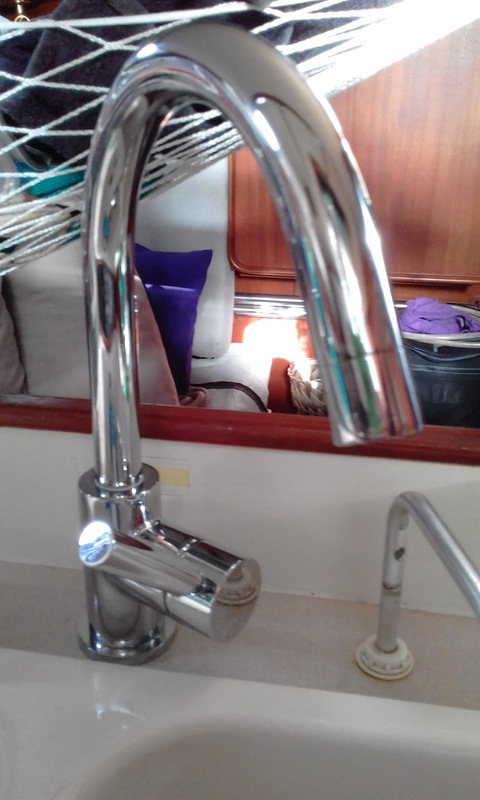 Our old galley faucet was pretty rough. The environment we live in had taken its toll. The surface was pitted and when we returned at the end of this summer, the head was stiff and didn’t want to swivel. Part of this was my fault. I don’t think I will ever get used to the corrosion that takes place in this environment. It still catches me by surprise. 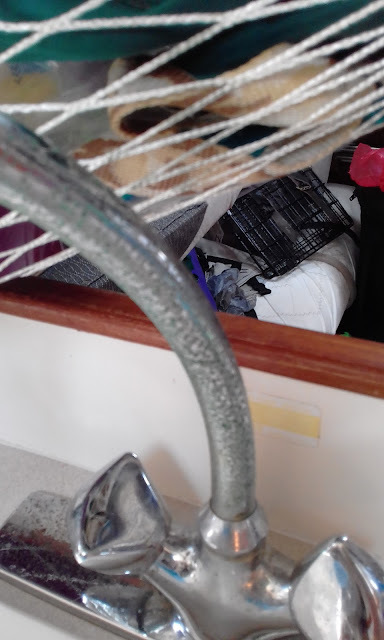 Turns out many “marine grade” things that are supposedly maintenance free, actually need special care and on-going maintenance despite the manufacturer’s claim. Additionally, the design of this galley faucet was terrible…..as is MOST faucets. It makes NO sense to me that the majority of faucets are designed so that once you are done using the water and reach to turn the handle/handles, the water from your wet hands pools behind the faucet leaving a mess to clean up each and every time. What genius came up with this stupid design? Seriously, think about most public bathroom, the sink area is a wet mess because the water shut off knobs allow water to pool on the counter and eventually, (after enough people) run all over the counter. Even high end, poshy posh faucets do this if they are part of that design group. The best faucet in my opinion is single lever, leaves no water mess. Yeah, it is a pet peeve of mine. I despise that water mess. Anyway, we have been casually looking for a replacement faucet for some time. 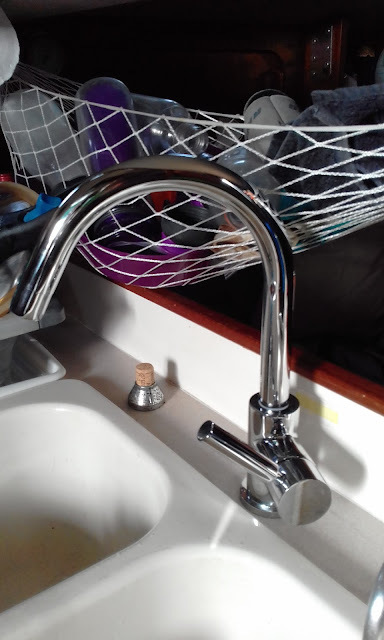 A fellow Caliber 40 owner replaced his last year with a nice, modern, single handle faucet. Oh…..maybe we should get one. We never quite got around to locating one. He sent a message at the end of this season “Don’t bother. It was rubbish and it has began to corrode.” Bummer. We would keep an eye out for one but this was not a MUST do project. And then we found it, the perfect faucet. We took an extra day in Ft Lauderdale FL when flying back to sv Honey Ryder in September. I don’t like the stress of flying straight through, worrying about making an international connection. It also makes for a really long day. And we don’t have a schedule, so why do it. Besides, the extra day gives us a chance to do some last minute boat odds and ends shopping on Marina Mile. 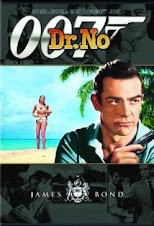 *Yes, it is really called that! 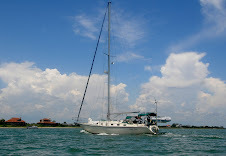 We went to Sailorman in Ft Lauderdale. It is a huge warehouse place that sells primarily second hand stuff, closeout items and open box items. All sorts of stuff in various condition from new in the box to really beat up. You just never know what you are going to find in there. We walked the isles slowly looking at all things boatie. Near the end there was an entire table of galley and head faucets - HIGH END faucets. I mean really good stuff, top quality with a simple yet sophisticated design. The perfect design – one handle, no mess! This stuff looked like it belonged on a mega yacht. NICE stuff. I looked at the price. WHOA! Yep, mega yacht stuff. Tom walked up next to me. His eyes light up and he looked at me. “I know! But this is NOT in our budget, trust me!” His smile faded. The Sailorman sales girl (that is a mouthful to say) said “The manager Rob over there just sold something off this table at a big discount. Make him an offer.” I turned to look at Rob thinking even if……..there was still no discount that he would approve that we could afford. Before I could say anything, she said “Hey Rob. She wants this one. How much will you sell it for?” Oh boy, here we go. Rob came over, looked at the shiny, beautifully designed galley faucet and said “Hum…..$50 bucks.” Wide eyed with mouth dropped open as well, I looked at Tom. He quickly said “SOLD.” Later we carefully wrapped our new galley faucet in clothes so it wouldn’t get scratched and Tom put it in his carry-on bag. 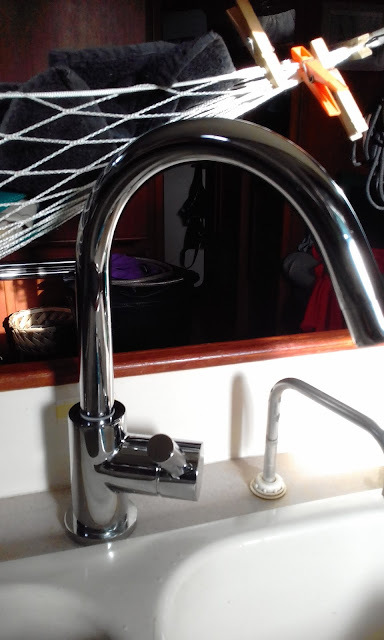 A few days after our return home to sv Honey Ryder, Tom installed the new galley faucet and we have been enjoying it ever since. It is perfect!! AND no watery mess on the counter behind. YAY!!!! 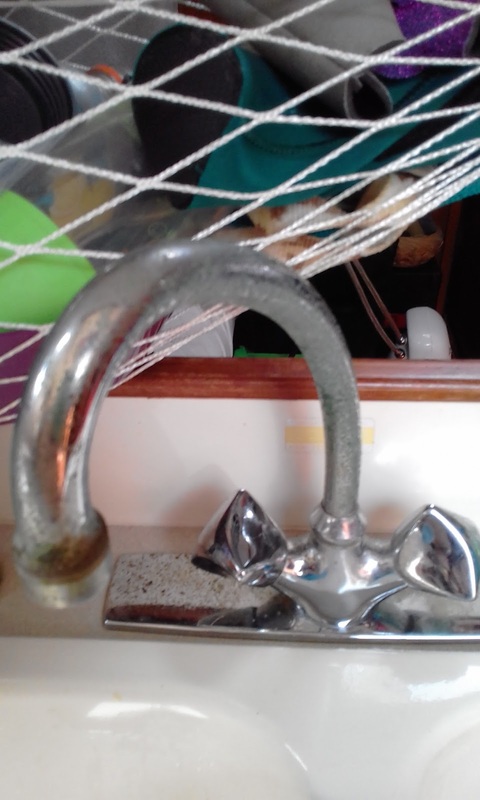 I would like to think I learn from history so despite the high quality of our new fantastic faucet, I wanted to be sure I knew how to take care of it – chrome plated brass. To my surprise – no paper or fibrous towels. D-oh. On the old one, we usually wiped it down with those blue & white fibrous, disposable towelletes. Recommendation is to use a soft, natural towel, no harsh chemicals. The installation? Don’t forget in 2013, Tom cut a big access panel behind the galley sink area in the settee seatback. See here if you want a reminder. This made removal of the old and installation of the new much easier. Super nice, and what a great price. I love stuff like this! We are having the problem with all the drippy water on our two-handled RV sink faucet. I am constantly drying off the countertop around the faucet. Might need to upgrade to one of these in the future.